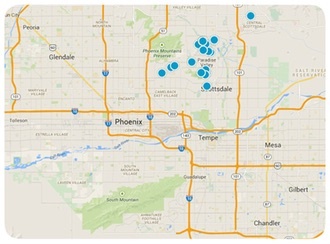 An upscale city in Phoenix's greater metropolitan area, Scottsdale real estate is a great investment. Its mixture of affluence and western culture makes the city a unique, exciting place to live. Known for its golf courses, spas, and shopping, but also excellent school systems, Scottsdale has something for everyone, and your Russell Shaw real estate agents have access to more Scottsdale listings than any other groups in Arizona, so let us know how we can help you. Use our Online Home Finder or view MLS listings to find the home for sale in Scottsdale that is perfect for you and your family. If searching the internet is not for you, call us today and talk to one of our agents for a more personally guided search for a Scottsdale real estate investment. We handle all of the details, and get you the best offers possible. With the many resources available to you through Russell Shaw, you will find that it has never been easier to buy a new home.